THE DIRTY ARMY: Hey so this is more of a public service announcement. Meet Nick Smyth ALTHOUGH he has three different names that I know of. Nick has only lived with me since September and it has not gone well. First of all when he replied to my kijiji ad he claimed he was clean, responsible and oh yeah 32. Turns out he is 35. I am 34 so why he would lie about his age to me is a head scratcher. He also claims he is a ESL teacher. I work from home and never once saw him go to work. I’m not sure how classes work these days but im pretty sure if you are fully employed as a ESL instructor you would have to leave the apartment occasionally. The guy is a pig he NEVER and I mean never cleaned up after himself he would use pans and put them back unwashed…. Like who does that? Never swept, took out the trash, wiped the counter nothing. I would text him about some of it and he said it would give him anxiety because his previous roommate would leave him post-it notes asking him to clean up after himself. WELL NICK YOU’RE A GROWN A55 35 YEAR OLD MAN!! NOBODY SHOULD HAVE TO TELL YOU TO CLEAN UP AFTER YOURSELF. FUK. He also told me his grandmother was sick and was going back to Nova Scotia to say goodbye to her, and when he got back I asked how was nova scotia and he said it was great. I am his roommate he could have just said he’ll be gone for a few days zero explanation required he didn’t have to kill granny. Well spoiler alert he actually went to Vancouver filming something!!!! And well its unsettling. I mean why lie? Was their even a sick granny? Why mention any of it at all? ! How did I find out? After we decided this was not going to work he had just gotten back from his trip and I went to take pics of the room for dimensions for the new roommate and I saw an ID sitting on a shelf ( the issue of his age has come up before when he told me to look him up on IMBD to look at his actor resume and it said he was 35. He said it was a mistake and he has been trying to change it forever) well the ID indeed confirmed he in fact was 35. And his hotel bill was sitting out for Vancouver… and the name on the bill was Nicholas Kidd…. 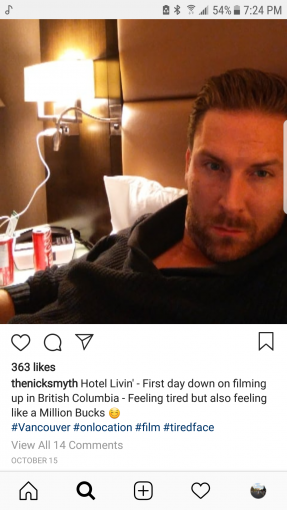 WTF his ID on the shelf says Nick Smith and I am pretty sure when you check into hotels you need to show ID and a credit card. Maybe that ID says he’s 32? LoL This guy is the epitome of a wolf in sheep’s clothing he is quite soft spoken and comes across as likable for a pathological liar who trashes apartments. When I asked him about the ID he doubled down and tried to insist he told me he was in fact 35. It wasn’t until I said I still had the kijiji response that he finally admitted to the lie. Same with the trip to Vancouver he said his family decided to meet in Vancouver instead of Nova Scotia last minute which I knew was BS but his instagram confirmed when he posted a pic Oct 15 saying “hotel life” filming in Vancouver. I didn’t and still don’t know much about him but everything he told me was a lie. Pointless lies I might add which are most unsettling kind because he had zero motivation to lie!! Most people lie to not get in trouble or to spare somebodies feelings… he lies just to lie. And god only knows how the Nicholas Kidd name plays into all this.. Turns out this wannabe actor plays make believe in his real life or is that what some people would call a con artist? And the cherry on this diarrhea covered sundae is that this dirt bag left the room with trash and boxes every where. His nasty a55 hair in the sink (clogged by the way) hair on the floor sooo disgusting. And his room has a stank a55 smell… pungent! So I thought it was only fitting for such a dirty person to be posted on ‘The Dirty’. Nick Symth/Smith/Kidd you probably need to get help for your pathological behavior its kinda out of control and maybe take a Home EC class. Finally for a bit of irony he actually showed me this site. Gotta laugh. And Nicholas Kidd if you’re reading this, your identity has probably been stolen buddy.